I love the Muppets. I grew up watching the movies, have watched the entire Muppet Show series multiple times, and have use far too many quotes in my actual daily life. I even wrote a research paper on the Muppet Show for my History of Television class in college. When the film The Muppets came out a few years ago, I loved it for being modern, yet being true to all the silliness and heart of the original Muppets material. The announcement for Muppets: Most Wanted filled me with hope, excitement and puns. Muppets: Most Wanted, however, is like the barbecue restaurant near my neighborhood whose delicious smell permeates the air as I walk or drive by, beckoning me. Once I sit at the table and the food comes, it looks as good as it smells. But then I taste it. It’s pretty good, but is far from the savory smell I had been anticipating, and could be so much better. In fact, the Lego Movie is almost a better Muppet movie. The plot is a silly, farcical adventure with gags jokes, and Brechtian moments (breaking the fourth wall). The entire movie pivots around a single gag: That with only the difference of a mole, Kermit is confused for the evil jewel thief, Constantine. There is chaos, there is silliness, there are chickens, explosions, bad jokes, a Muppet News Flash or two, and plenty of ridiculous moments. The Muppets themselves remain true to character, which is a tricky accomplishment. Often, Miss Piggy can be portrayed as more selfish and mean than originally, but this time they remained true. Kermit’s ability as a leader allows him to excel in the Russian prison. Even the key humans, Ricky Gervais, Ty Burrell, and Tina Fey, bring a Muppetiness to the movie. They blend with the Muppets, helping build the supposed reality. Once again, Bret McKenzie uses the silliness he honed from Flight of the Conchords and adapts it to the Muppet world. While none of the songs quite reach the greatness of “Am I A Man Or A Muppet?”, but remain fun, snappy, and full of wry humor. In short, not the greatest Muppet songs, but definitely worthy of the overall canon. I think the top two are “We’re Making A Sequel” (see above), and “The Interrogation” (below). My third favorite would have to be the Russian prisoners singing a song from Chorus Line. Part of the success of the Muppets is the integration and random arrival of current and legendary celebrities. From the hosts of the Muppet Show, to the random appearance of celebrities in bit parts, part of the fun is seeing how many celebrities show up. I love the Christopher Waltz Waltz, the willingness of Salma Hayek to wear a ridiculous costume, the many known celebrities among the Russian prisoners (especially the one locked in a box), and the random appearance of Tom Hiddleston. These are all great, small throw away moments that add just a touch to all of the giggling. While both The Muppets and Muppets: Most Wanted are built on nostalgia for the Muppet Show, the nostalgia in this film for the 90’s was random. Just random, not Muppet joke random. 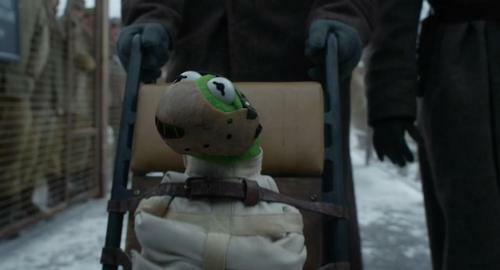 First, Kermit is brought into the Russian jail in Hannibal Lecter gear. Not only is this from the early 90’s, but it is also a reference to a really disturbing and non-Muppety movie. Second, Miss Piggy’s grand number becomes a magnificent duet with Celine Dion. While Celine Dion remains a legend, and the whole sequence embraces its ridiculousness, it is odd. 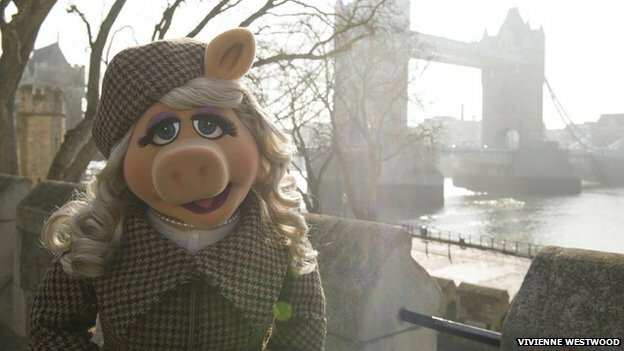 Although, Miss Piggy does look amazing in the tweed outfit worn during the song. Sam The Eagle works with Interpol Agent Jean Pierre Napoleon (Ty Burrell in an Inspector Clouseau style role) to investigate the heists. Kermit goes on a road trip to Hollywood to become a star. Along the way, he makes friends and they join his journey. Doc Hopper chases Kermit to force him to be the spokesfrog for Hoppers Fried Frog Legs, a fast food chain. Seven vs. three plot lines. The plethora of plot in Muppets: Most Wanted waters down the potential for the whole movie. Each of the plots is entertaining, and they do build to an overall story, yet there does not feel like there is an over-arching plot. The film feels a little scattered as it jumps between one story and another. If it could have been a bit more focused, like The Great Muppet Caper, it could still have the heist element, but been much more fun. This is a tricky question. Coming in with about $50,000,000 domestic and $78,000,000 worldwide, the movie has squeaked in enough from the box office to break even. It might pick up a bit more with blu-ray/DVD sales, and merchandise tie-ins, but this is not a high enough number to guarantee a sequel. Just like most of the movie, it is good, but not amazing. I hope we can have more of this team bringing us Muppets. They are bringing the best Muppet material we have seen in decades, and they might hit a third film out of the ball park. Hopefully, Disney will give this franchise one more shot, and the film makers can bring a bit more heart and focus to the silliness. 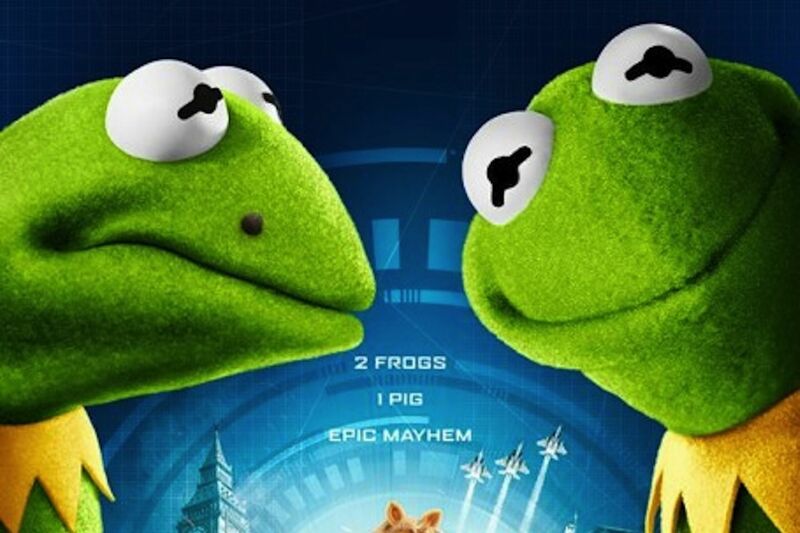 What did you think of Muppets: Most Wanted? What was your favorite part? What would you have done to make it more awesome? If you were to have a Muppet spin-off movie, which character would you base it on? Have you ever been disappointed by a restaurant where the smell was much better than the actual food? If you were a Muppet, what type of restaurant would you go to? 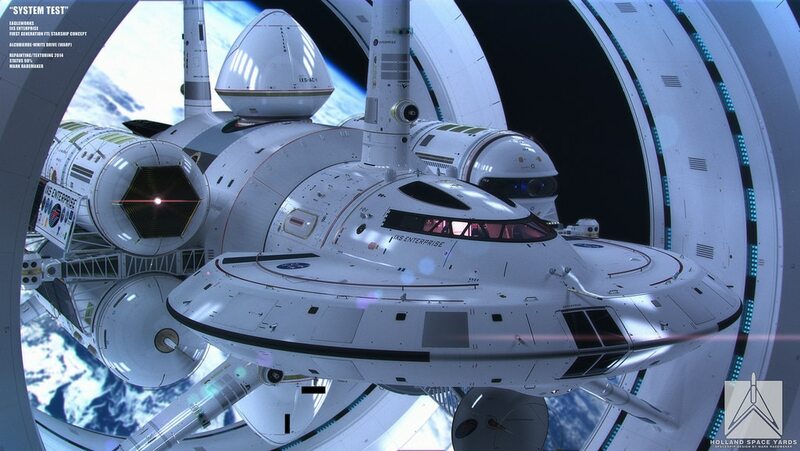 SIDE NOTE 1: There really isn’t an answer of what to look forward to for The Muppets, so instead, we’ll look forward to theoretical spaceships which may become a reality within our lifetime. Check this out. WHAT!?! Thanks for this excellent review. Sequels are such a tricky beast. The temptation to go bigger has usually backfired. It sounds like they probably needed to cut down on some of the excess and cliches. But it’s great that they can still get celebrities to do cameos. Just wanted to say, that trailer for Korra has me SO EXCITED! I’m excited to see what they do now that the Spirit World Portal is open – this also means more Miyazaki-eque design. I still haven’t seen this one, but I’m still giddy about it. 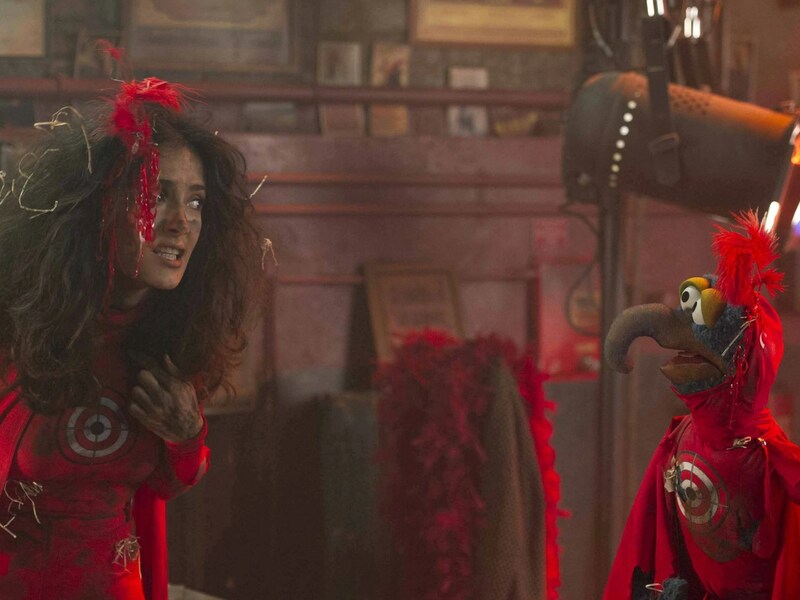 Tina Fey and Muppets seem like the perfect combo. So, I didn’t read the whole post. Stopped at spoilers because I haven’t seen the movie. I freaking love the muppets and am sad that you found it left you wanting. I did kind of feel that way about the last one when I found out that Kermit and Miss Piggy were estranged and he was living alone. I’ll come back and read this once I watch it. There are a lot of great things in the movie – great gags, great songs, and uses of characters. In the pantheon of Muppet Movies, it is much better than Muppets Take Manhattan, but not as good as The Great Muppet Caper. Glad you enjoyed the post. It appears you would be a good enough fan to see who the real Kermit is.